A Taste Of Iran, Whipped Up In The 'Conflict Kitchen' At this new takeout restaurant in Pittsburgh, the only food served is from countries the United States is in conflict with. The sandwich that's currently on the menu -- the kubideh -- is from Iran and comes in a wrapper covered with information meant to spark conversation. Lucy Wang rolls up an Iranian kubideh wrap sandwich in the prep area. The sandwich is made with homemade bread and grilled ground beef mixed with turmeric, cumin, cinnamon, mint, basil and other spices. Conflict Kitchen is a takeout cafe designed and run by three artists hoping to open a conversation about countries in conflict with the U.S. by serving one dish from a particular country a month. When most Americans hear Iran or North Korea, they think of the United States' unsavory entanglements with those countries. But an eatery in Pittsburgh is giving customers a savory introduction. It's called the Conflict Kitchen, and it's a new takeout restaurant that will only serve food from countries the United States is in conflict with. For now, the sole menu item is a sandwich from Iran. "That's the only thing we're serving is kubideh, which is ground beef with sumac on top, with a little bit of parsley, basil, fresh mint and onion all wrapped in freshly baked barbari bread," says Dawn Weleski, who worked the counter on a recent day. Weleski is one of the co-creators of the restaurant. The eatery is an experimental public art project -- and the medium is the sandwich wrap. Conflict is defined as anything from an armed dispute to an embargo. The creators chose Iran because they knew people there -- and Iranians in Pittsburgh. Weleski says opening the restaurant added a layer of cultural diversity to the city -- it's the only Iranian restaurant around. At the same time, though, the Kitchen crew didn't want to alienate Pittsburghers. "We wanted to choose a food that was sort of an everyman's food, a food that you would find on the streets of Tehran," she says. "And everyone understands a sandwich. It's something you can take with you -- there's a little girl running by right now, skipping and eating her kubideh sandwich at the same time, and a lot of people have said they feel like it's a Persian hamburger." The entire experience is meant to spark conversation. The Conflict Kitchen's colorful exterior boasts Farsi words. The sandwich comes in a wrapper covered with information and perspectives from interviews with Iranians on everything from film to nuclear power to the green movement. 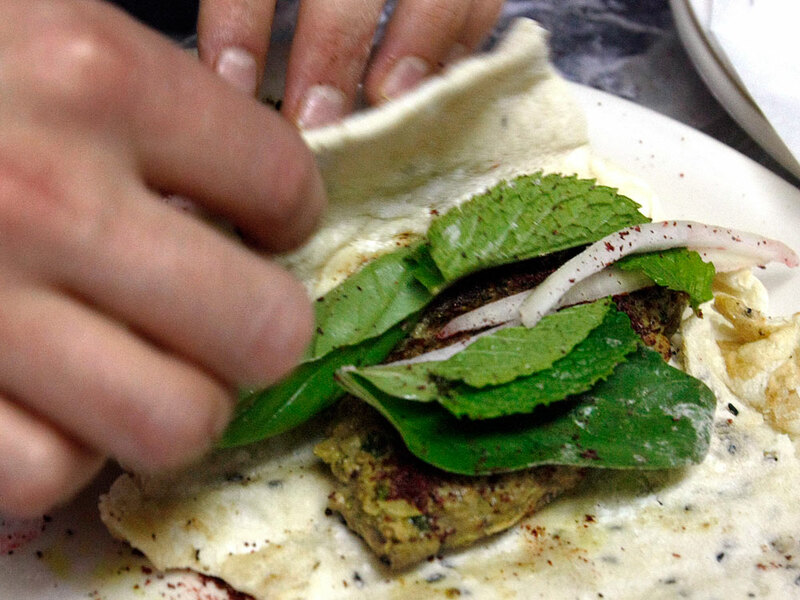 Dawn Weleski grills ground beef for Conflict Kitchen's Iranian kubideh wrap sandwiches. "People have a negative image of a lot of countries based on the leadership in that country," says Daron Christopher, a grad student who stopped by with some friends. "And I think what they are doing here is promoting the idea that what's more important is the people, customs and culture and that sort of thing." In a few months, the grant-funded restaurant will switch countries -- and cuisines. In September, it will serve food from Afghanistan. After that, maybe Venezuela or North Korea. 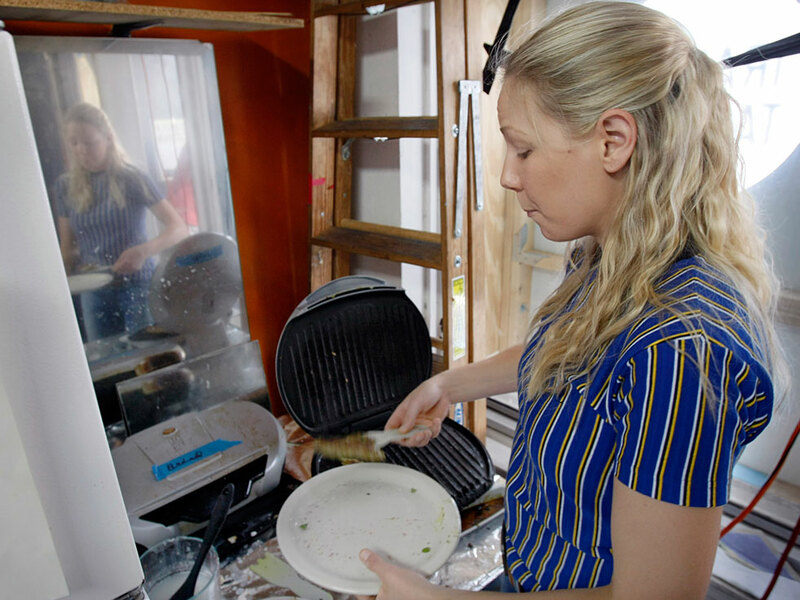 "You know what, it's delicious," says Joni Perri, a Kitchen regular who works nearby. "Every bite full, delightful. And it's just smashing that stereotypical myth that just because there is conflict in those countries ... I don't let it stop me from buying good food." Weleski says what most people know about the featured countries is through the media. To prompt the discussion, she will host events such as live webcam meals with diners in Tehran. Alex Ward recently paid his second visit to the Conflict Kitchen. Between visits he read up on Iranian culture, learning about religion and literature. "We have a lot more in common with Iran than I would have guessed," Ward says. Ultimately, though, he says he came back because he likes the food.